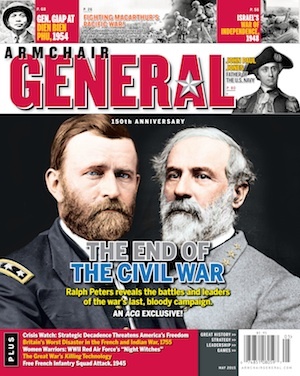 History News | Armchair General Magazine - We Put YOU in Command! Link to an infographic of the 10 Largest Air to Air Battles in Military History. Theodore "Dutch" Van Kirk, last surviving crew member of the B-29 "Enola Gay," passed away Aug. 27, 2014. Information on a photography contest related to World War 1 and its centennial observations. Mount Vernon is offering visitors a chance to see how ice cream was made in George and Martha Washington's time and to taste popular flavors of that era. Chester Nez, the last surviving Navajo Code Talkers of World War II, died at his home in Albuquerque, New Mexico, at age 93. The US Navy's Naval History and Heritage Commission has placed online over 500 photos of items from its extensive collection. The Hartford Courant, America's oldest continually published newspaper, chose the month of May to spotlight Connecticut's role in US military history, from the Revolutionary War to the 21st century. Britain's National Archives' project Operation War Diary needs online volunteers to tag information in World War I diaries that have been digitized. The creator of the ubiquitous AK-47 automatic rifle, Mikhail Kalashnikov, is dead at age 94. The Civil War Trust announces Giving Tuesday: Giving Back History, a fundraising campaign to preserve battlefield land in several states and promote history education. A campaign on Kickstarter seeks to restore the "courting couch" where Abraham Lincoln and Mary Todd sat during the early part of their courtship. The Harrisburg, Pa., Patriot & News today retracted its Nov. 24, 1863, editorial that referred to Abraham Lincoln's Gettysburg Address as the "silly remarks of the President." The remnant of a crashed B-17's turret, which has sat in a chicken coop in Belgium since World War II, will be presented to the daughter of the pilot, Jim Dimel, on Veteran's Day. If not for a Gettysburg College alumnus, President Abraham Lincoln may not have delivered one of the most memorable speeches in American history in November 1863. On November 11, 2013, the US Postal Service will unveil World War II Medal of Honor Forever stamps as part of a ceremony at the National World War II Memorial in Washington, DC. In 2014 Arlington National Cemetery will host a series of events in observance of its 150th anniversary.